I hate the subtitle to this movie. Of course money never sleeps. Money is something that is constantly moving, whether we can see it or not. We know this. So why use the subtitle that they used? I mean, they could have come up with something better like "Burstin' Bubbles" or something like that. Or they could have just put a two on it and left the subtitle off. The subtitle is the first thing I hated about this movie. This is, of course, the sequel to the 1987 hit Wall Street. That movie is remembered for winning Michael Douglas an Oscar and giving the 80's its own catchphrase, Greed is Good. That movie was pretty good. The sequel is not. We are reintroduced to Gordon Gekko (Douglas) as he is getting out of prison. Then the movie jumps forward seven years to focus on Shia Lebeouf. The whole opening scene is pointless. We get a few forced laughs about how long Gekko has been in jail. We also get to see him standing outside the prison as he waits for someone to pick him up. We later find out that no one came to pick him up. This whole scene is pointless because it is spoken about later in the movie. The only reason I can think of to use this scene is to put Douglas in the first twenty minutes of the movie. Without the scene, he doesn't show up until later. So we are introduced to Shia Lebeouf. He is a day trader (I think) who is trying to raise money for a fusion plant in California. But then Josh Brolin comes in and starts spreading BS rumors about the company that Lebeouf works for, so he can buy the company for cheap. You know what? To tell you the truth I have no idea what was going on in this movie. I know nothing about stocks and bonds and commodities. I know zero about anything that goes down on Wall Street and that is probably for the best because that leaves me ignorant to the troubles these people are putting us through. Sure, I know about the troubles we are facing, but it is nice to know that I don't know the half of it. Watching this new Wall Street I got to thinking about how pointless this whole movie is. There is no reason to go back and revisit Gordon Gekko and the stuff they show us in this movie about how much trouble we are in, is better documented in other movies. Gordon Gekko is a man of the eighties, when stealing other people's money was frowned upon, but not totally understood. Here, when Gekko tries to go back to his old ways, it seems sad and a little fucked up. This is all this man knows, but we don't feel for him because he represents all of the people who are stealing our money now. I did not connect with any of the characters in this movie and could care less what they were doing. 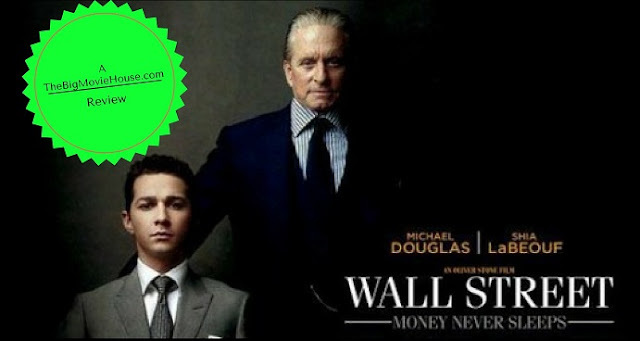 When Oliver Stone made the original Wall Street, the movie felt fresh and alive. Now, with this movie, Stone feels like he is on autopilot. Add to that an ending that stays true to none of the characters or actions that came before it, and you have yourself a true blue bad movie.